Malaria is considered the number one public health challenge in more than 90 countries inhabited by 40percent of the world’s population. According to the World Health Organization (WHO), the situation in Africa is devastating and sub-Saharan Africa is the worst affected area on the continent. WHO reports that an estimated 1.1 million malaria deaths were prevented during the past decade through a scale-up in malaria prevention stemming from global partnership between the governments in countries where malaria is prevalent and donor agencies that provided funding and other technical support. Of particular interest is the collaboration between the U.S. Agency for International Development (USAID) and the Ghana Health Service (GHS) with the Malaria in Pregnancy program. Accomplishments that stemmed from this program include improved care for pregnant women through enhanced training and drug administration, pre-service training for those in the health field and sponsorship of communication activities to encourage pregnant women to seek regular care during pregnancy and take preventative measures. This article focuses on best practices derived from the Malaria in Pregnancy training manual for providers and how best practices for communication between provider and patient can be translated to the relationship between organizations in collaboration. The first recommendation from the Malaria in Pregnancy program is to focus on the situation, issue or behavior and not the person. Focusing on the situation makes it easier for patients to accept recommendations from providers because they know the “order” is intended to improve the situation and not as an exercise of power for its own sake. Similarly, the law of the situation can make it easier for organizations to give and receive directives. In collaboration, some organizations may chafe at the idea of being directed by another organization that does not have official authority over them. Making it clear that the order stems from the situation all the organizations are facing can make this more palatable. This idea has been a lasting tenet of organization theory since Mary Parker Follett’s classic 1926 article “The Giving of Orders,” published in the book Scientific Foundations of Business Administration. A similar point was made in a 2012 Journal of Public Administration Research and Theory article by Kirk Emerson, Tina Nabatchi and Stephen Balogh titled “An Integrative Framework for Collaborative Governance.” They note that power is almost always a resource that is distributed unevenly across participants. The skill with which this power differential is managed has a major effect on the success of the collaboration. Therefore, it is essential to move collaborative participants to joint action without making less powerful organizations feel subservient. Emerson, et al. suggests that finding ways to redistribute power across the collaboration leads to better results. If more powerful organizations share some of their power with those that have less, it should result in less powerful organizations having a greater stake in the collaboration’s success and thus being more willing to accept the law of the situation. The second recommendation is to maintain constructive relationships. As this relates to providers and patients, it is important that dialogue remains open throughout the treatment process and that the communication focus on constructive recommendations, avoiding criticism that could be taken personally or viewed as an attack. The same holds true for collaborative organizations. Even during periods that do not require the collaboration, organizations should maintain the lines of communication so that when collaboration is necessary, the system is still fully operable. Emerson, Nabatchi and Balogh discuss shared motivation as a cornerstone in a successful collaboration. A key element of shared motivation is developing trust, understanding, internal legitimacy and commitment. All of these are essential to a successful collaboration and all of these must be built and maintained over time. This leads to the third point which is do not control the conversation. Providers in the Malaria in Pregnancy program are advised not to control the conversation with patients. By too closely controlling the information during a consultation, the provider runs the risk of missing important information that they did not ask for and did not allow the patient to share. This recommendation has implications for collaborative organizations as well. One organization may assume the position of leadership and try to direct the conversation toward their chosen agenda. 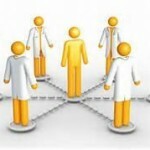 By doing so, the lead organization runs the risk of crowding out the ideas and concerns of other organizations. This could lead to important information being missed that may affect the collaboration’s success. Emerson, Nabatchi and Balogh address this by proposing a practice of principled engagement. This involves a process of discovery, definition, deliberation and determination. Collaborative organizations come to a mutual decision through 1) assembling facts regarding a situation, 2) defining problems and opportunities presented by the situation and options for action, 3) engaging in a tough and candid conversation to determine which options are likely to lead to a good result for all participants and 4) determinations, or coming to a decision together. It is important that all organizations have a voice at each of these steps in order to reap the full benefits of the collaborative process. In fostering collaborations such as the one between the GHS and USAID, organization managers should take care to focus on the situation, maintain constructive relationships and avoid trying to control the conversation. This maintains the framework for joint action, shared motivation, and principled engagement as suggested by Emerson, Nabatchi and Balogh. Like the human body, collaborative organizational relationships can be strong and vital, or they can fall victim to weakness and malaise. Applying the same lessons that the Malaria in Pregnancy program imparts to their providers to building and maintaining collaborative networks could be essential to maintaining the health of those relationships and keep these collaborations serving the people that need services most. Author: Nathan Myers earned a Ph.D. in Public Affairs at the University of Nevada, Las Vegas in 2009. His research interests include federal and state health policy, public health policy and administration, program evaluation, and bureaucratic politics and behavior. Myers has previously published research on the effectiveness of state health care programs in Policy Studies Journal, Politics and Policy, California Journal of Politics and Policy, Administration and Society and the Journal of Health Politics, Policy and Law. He is currently an assistant professor of political science and public administration at Indiana State University. Author: Elvis Asorwoe is a doctoral student in public affairs and a teaching assistant in the Department of Public Administration at Florida International University. Asorwoe’s research interests include public policy, health care policy, e-governance and public sector management. Asorwoe worked in local government for 10 years in the Hohoe Municipal Assembly in Ghana. Asorwoe is also a consultant to the BUSAC Fund, a private sector support mechanism created and funded by DANIDA, with further support from USAID, DFID and the European Union.